Let’s welcome August with a fabulous give away! 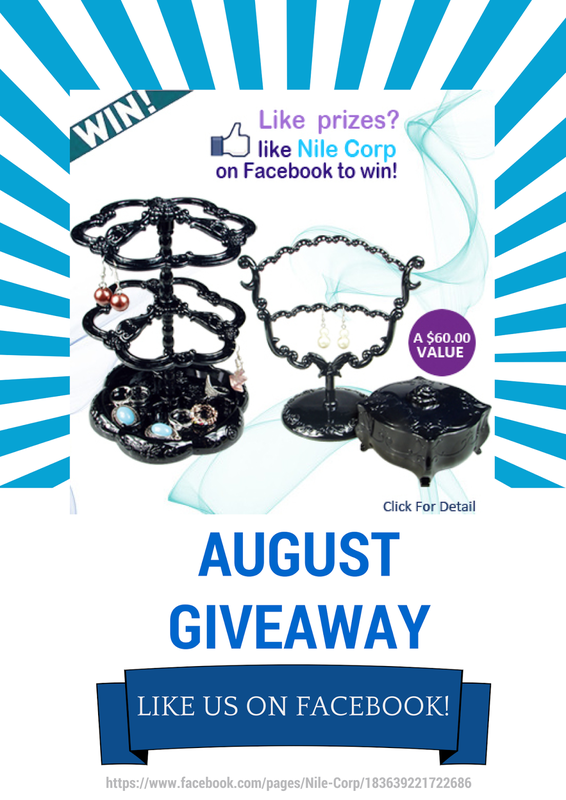 When you join this month’s promo, you’ll be entitled to win a black jewelry display which includes a dual layer earring display, ring box and earring display stand. This jewelry display set is a great addition to your jewelry business and can hold different jewelry pieces in your retail store. If you’re joining trade shows, jewelry parties and other events, this display set can surely help make your display standout. Jewelry enthusiasts and collectors can also use this display set to showcase their fashion rings and statement earrings at home. Are you ready to win this giveaway? Visit our Facebook page and click on Win Giveaway tab. Fill up the form with your name, address, email address and other info then click enter to join. Only one entry is allowed per Facebook user but you can invite as many friends as you like to join this fabulous giveaway. This promo runs from August 1 to 31 so hurry and join today! Doing a quick wipe down on your jewelry pieces before closing down your store everyday is a usual practice to keep your inventory clean and tarnish free. But once in a while, it’s also important to take down your displays and start cleaning your necklaces racks, busts and mannequins. Keeping your necklace display racks and cases in its best condition is a must if you want your jewelry store to look spotless. When you start to notice dusts settling on the corners of your display case or your glass display cabinets getting filled with smudges and finger prints, it’s time to get your cleaning materials and restore it back to its former glory. Having acrylic counter top display is great in showcasing your precious earrings and rings. It allows your customers to see your collection and decide which piece they like before asking to try it on. But since it’s pretty interactive and your customers may find it entertaining to play around a revolving display, it can often get smudged with fingerprints and other dirt. To avoid this, make sure to wipe your acrylic display with microfiber cloth or other non abrasive material. This way, you can keep your counter top display clean while avoiding scuffs and scratches. One of the most challenging parts of cleaning your jewelry display is reaching the tight corners of trays and racks. Use hand held vacuum cleaners or regular vacuum with detachable hose to clean storage organizers or carrying cases. Remember to keep your vacuum clean to keep your display from being soiled. Jewelry displays are often touched upon set up and breakdown making linen display busts prone to getting soiled. To remove soil build up in your display, use damp cloth dipped in water with mild soap. Apply gently upon the affected area. After cleaning, blot the area with cloth dipped in clean water to get rid of the soap. Use a hairdryer to remove the moisture from the busts. As much as possible, regularly clean your linen display busts as dirt can be harder to remove after a long time. Seeing lint all over your velvet or leatherette necklace display can be a annoying. Remove the visible lint and other particles by using lint rollers. Another way is to wrap a transparent tape around your finger and dab the ring display in your store. Having a clean jewelry display does not only give a good impression to your customers but also keep your jewelry store clutter free. If you have other question about how to maintain your jewelry display along with other inquiry, you can send us a message through our Facebook page or call our phone number. If there's one thing summer is known for it's colorful fun colors! The crystal blue ocean, the vibrant tropical flowers, the stunning gemstones, and sunny sunshine. Nature is blooming all around inspiring shoppers to hit the malls, the boutiques, and the fairs. If you want to attract customers for the season, it's best to have your store's decor match the season. Adding a splash of color is a simple way to incorporate summer's fun environment into your jewelry displays. As many already know, color is a powerful tool in advertising. Color can generate tons of emotions for consumers and also attract onlookers walking by your store. It does have disadvantages if you have chosen a color that is uninviting it could detract customers from entering your store. Use some neutral tones as backdrop and add a hint of bright color with your accent points. The perfect summer combinations are a neutral and a bright color in one scheme. Referencing the pantone 2014 color scape for summer weddings is a great way to get inspired for your store's decor. Fusing bright orange with dazzling blue is a popular this season to really make a splash with consumers. This combination will reflect the warmth of sandy beaches and sunshine while still giving off a calming feeling of the ocean. Other effective color combinations include Freesia yellow and hemlock green. This will give off the soft calming feeling of lush daisy fields on a summer camping trip. Whatever your choice of color for your summer jewelry displays, be sure to tie it in effectively throughout your store so that you stay consistent with your overall theme. Use small props in the window, throw in accent pillows of this color on your fitting room area, and make your packaging match with ribbon and tissue paper. It's these small details that will make consumers remember your jewelry store and make them more willing to make a purchase from you. With the latest arrival of different jewelry displays, you now have more options as to how you can showcase your jewelry in your retails store or when joining events and trade shows. This summer, we’d like to bring you more ways to showcase your vibrant jewelry pieces in a chic, stylish yet neat and elegant way. No need to go looking for other sources for your ring or necklace display needs because we made sure to pick up the pieces that will be useful for your jewelry business. We also have different Wooden Rotating Earring Display, Wooden Glass Top Case, and Wooden Bangles Display to keep your display organized and attractive to your customers. Are you ready for some exciting treats? Below are some of the items that you can find in our New Arrivals section. Enjoy your shopping! Start your shopping by clicking here. Finding the right display racks and cases can add to the overall impact of your jewelry. It also helps you create a look that can appeal to your target market better and allows you to showcase your jewelry in a more attractive way. One of the most popular choices when it comes to necklace display nowadays is the Acrylic Jewelry display. It is made from high quality plastic that is transparent and resembles the look of a glass display. Because of its elegance and durability, acrylic display is starting to become a popular choice in jewelry displays not only for retailers but to the hobbyist as well. Here are different types of Acrylic Display that you can use to showcase your jewelry collection. This display case gives varying height to your jewelry displaying giving more exposure to your fashion rings and engagement ring collection. It also allows your customer to see your collection from a good distance making it extremely useful during trade shows and events. Bangles and other statement pieces will surely benefit from this type of display. Because it has transparent surface, acrylic T-bar display can make colorful jewelry standout among your collection. T-bar displays are available in varying height so you can use it display necklaces, and bracelets in your jewelry store. When joining trade shows and events, it is important to have a display that is lightweight, sturdy and eye-catching. Unlike other form of display, acrylic can survive rough weather and windy days. It also looks great in outdoor and indoor event as it can let your product shine without exerting too much effort. Perfect for luxury pieces, acrylic countertop display can easily add a classy look to your jewelry store. It can store different earrings, necklaces or rings in a revolving display, making it easier for customers to choose what to buy before asking to try it on. The height of the countertop displays can help make your jewelry more recognizable and more attractive to store visitors or trade show goers. Place it in the middle of your display table or in a place where your customer can turn and rotate your display for a better look at your creation. Are you looking for acrylic jewelry display? Visit NileCorp.com and discover different ways to showcase your jewelry through high quality acrylic display. 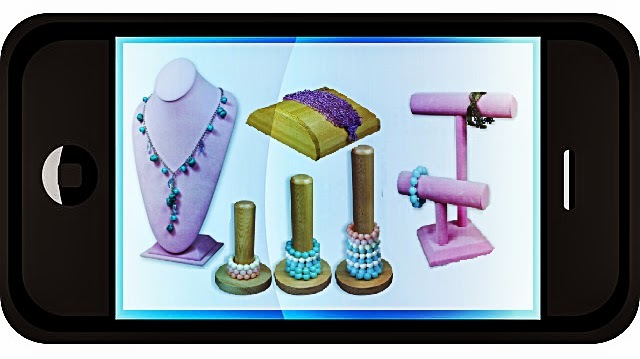 Also check out our slideshare page for more information about acrylic jewelry display. If you own an online jewelry display store, you might be thinking that creating a competitive website and a strong social media presence is enough to win the competition. Apparently, with the latest development in technology and the way it affects the purchasing habits of the consumer, there might be something else that you should be spending your time on -like making your business mobile ready. Here’s an interesting fact: Mobile search has grown five times in the past two years and 52% of all local searches are done on a mobile phone. A stunning 9 out of 10 mobile searches also end in successful purchase. So if you’re still thinking why you should make your jewelry business mobile, maybe this is the time to start saying – why not! Still hesitating to embrace the change? Let us give you some reasons why you should work on making your online store more mobile friendly. Taking the leap to making your website mobile ready may mean added expense but giving your customers a more comfortable way to shop may actually be worth it. With mobile apps or mobile optimized jewelry website, people who want to look at your products can conveniently do so through their smart phones. To keep your business running, it’s necessary to have something that will give you an edge against your competitors. If you haven’t shifted to mobile, maybe your competitors already did. Don’t be left behind and take the step to show your customers that you too can give them a quick and easy access to your store anywhere they go. Being where people are is a great way to gain more exposure for your jewelry store. And because more people will be aware about your brand, more sales opportunity will occur. Aside from that, customers love buying from online stores that offers the easiest and convenient way to shop. Keeping your jewelry store mobile ready will naturally drive more users to your website. How about you? Have you made the decision to make your jewelry business mobile? Share us your thoughts in the comment box. Giving a customer a piece of jewelry that they will treasure forever is every jewelry maker’s and designer’s dream. From choosing the designs down to the details of jewelry, it’s important to give them something that showcases your skill as a jeweler but also accommodates your customer’s personal preference on what kind of jewelry they would like to wear everyday. Offering a highly customized ring or necklaces is definitely a great way to get ahead of your competitors and establish great connection with your customers. Some ladies love anything that they can purchase right from your ring or necklace display, but there are few who would definitely love to have their accessories exactly how they want it. Since jewelry is one of the most sentimental items that is usually given during engagement, anniversary, birthdays or during life’s important milestones, a lot of people are willing to pay the extra cost to have a ring or bracelet customized. If custom orders are something that you’ve considered offering, you have to be prepared to go extra mile for your clients. At the same time, it’s also important to know where to draw the line and be smart in managing customization requests. Here are some of our tips to stay on top of your customized jewelry business. Achieving the best customized output starts with understanding what your customer really wants. Listen to their stories and learn where they are coming from. You can also encourage them to tell you their story and the purpose of their jewelry so you can give them an expert’s advice about the jewelry they want to purchase. The more you listen to your clients, the more you will understand the importance of your work and in return, your customers will find it easier to trust you with their wishes and requests. Offering customized jewelry will definitely expand your skills and understanding about jewelry. It also allows you to try different styles and techniques and will build your confidence about your product. However, customization often entails a lot of hard work and time that it will sometimes drain your energy and creativity. So before accepting a project, create an estimate of how many hours you have to dedicate to complete it and the rundown of materials and tools that you need to come up with a unique jewelry. This is an important part of creating a customized jewelry. There are some cases where a startup jewelry designer feels a little shy when putting value on their art piece that they undercharge for their work. However, knowing how to charge accordingly will protect your business and keep you from giving away precious pieces that cost a lot of your time and passion. Read different industry blogs or visit other jewelry designer’s store to have a clue on how to price your customized jewelry.